Fu Manchu at Slim's Proves the Action is Still Go! 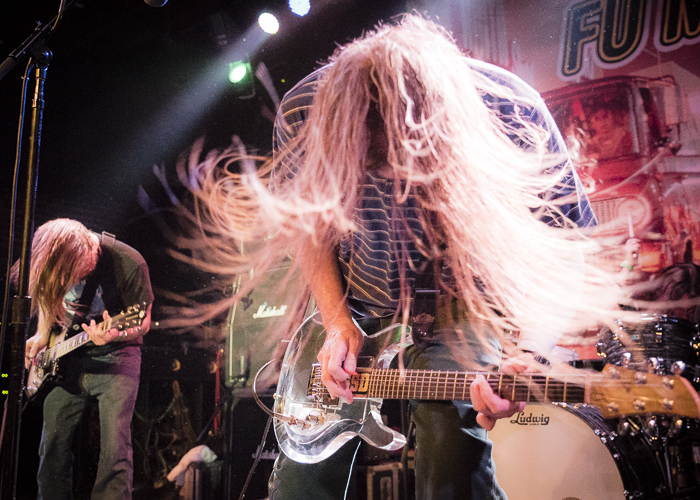 Fu Manchu at Slim’s Proves the Action is Still Go! 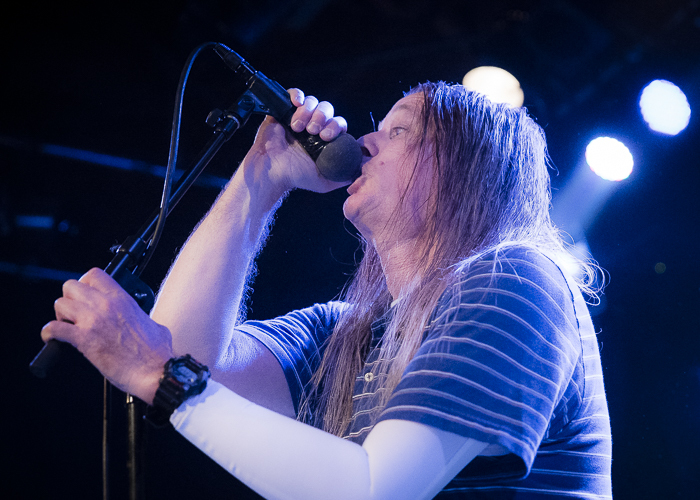 The only thing that would have made the recent Fu Manchu show at Slim’s more of a spectacle would be if a half pipe were to have popped up out of the middle of the floor. 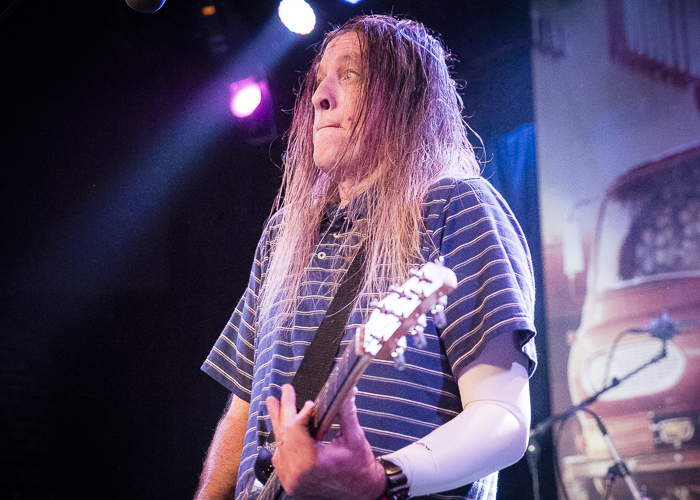 The veteran Orange County band of stoner/skater/surf punks rolled a nearly two-hour set of hard driving rock designed to be blared from the car stereos of muscle cars and surf vans. 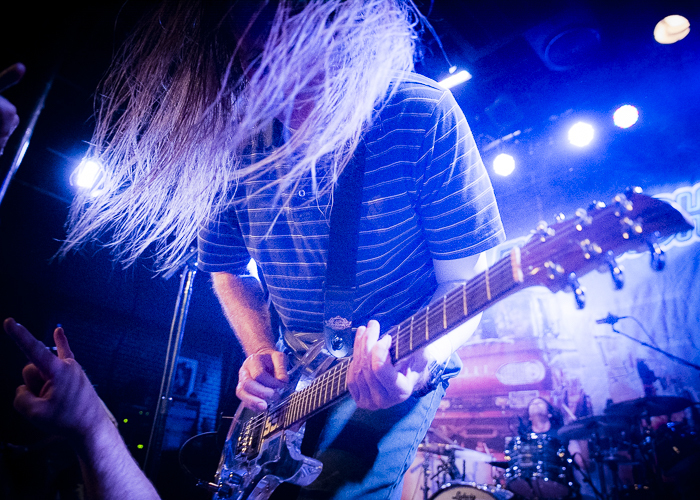 Comprising Scott Hill (guitar / vocals), Brad Davis (bass), Bob Balch (lead guitar), and Scott Reeder (drums), Fu Manchu has been delivering souped-up, fuzz-drenched riffage designed for skate parks and beach parties for decades. The final chord of the opener had barely pierced the atmosphere when Hill and Balch spun their dual layered swirl of guitars into the infectious stomping intro to ‘Squash That Fly’ (California Crossing – 2001). 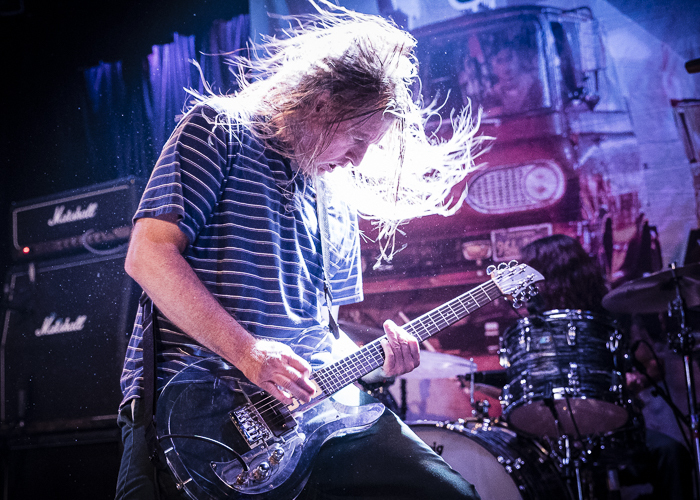 Fu Manchu has been tragically under-rated nationally despite a pedigree that aligns them with the likes of underground heroes such as Kyuss, Monster Magnet, and Clutch. However in their home state of California, these guys are revered for their ripping live performances. This night at Slim’s they took no prisoners. 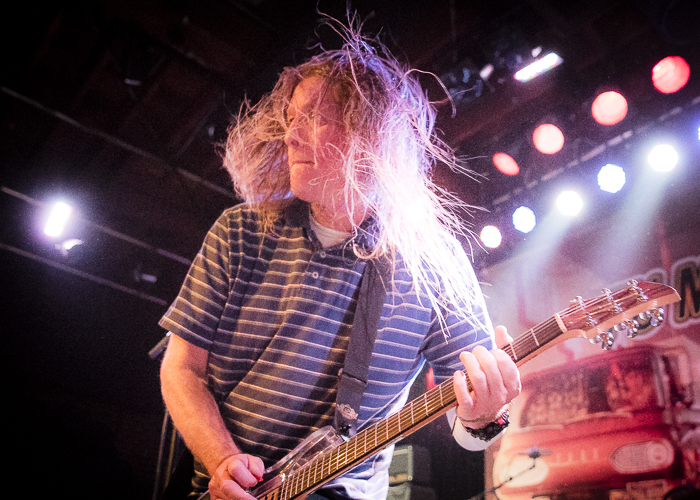 Cranking out gargantuan rock in front of a stage backdrop sporting a line of cherried-out vans with Fu Manchu emblazoned over the top, Hill and Balch let loose, head banging with a ferocity that would leave lesser rockers with whiplash. No Fu Manchu musical recipe would be complete without fuzz wah. What is that, you may ask? Well the boys answered that question with the nuclear fuzz wah of ‘Evil Eye,’ the lead track off the 1997 stoner rock staple The Action Is Go. If that wasn’t enough to make the inside of your brain fuzzed out like a bong rip to the dome, the next number ‘Cyclone Launch’ (In Search Of… – 1996) would leave no doubt. 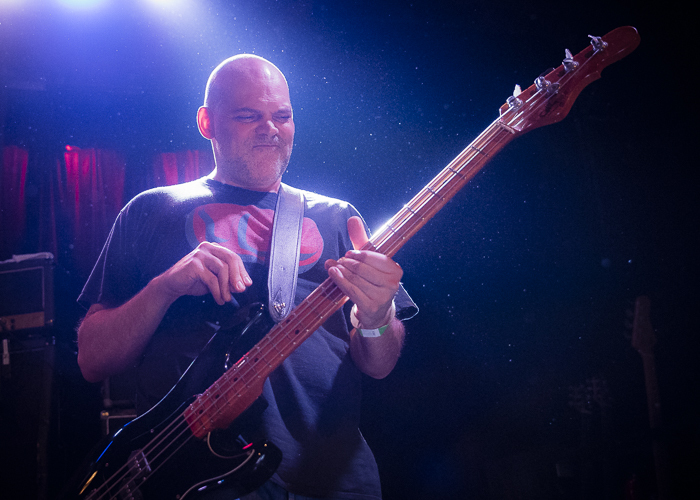 By the time it was all over, the roar of the crowd took over to shake the room just as heavily as the rumble of Brad Davis’ bass and Scott Reeder’s pounding drums. After firmly establishing the manic rock that catapulted them out of Orange County in the 90s, it was now time to pull a rabbit out of the hat…some Fu Manchu magic in the form of a new joint. The as yet unreleased ‘Clone of the Universe’ (set to be unveiled in Feb 2018), showed that the band is still cultivating their sound, an amalgam of Black Sabbath and The Misfits with a chromed out dual carb V8 sheen. With the new material out of the bag all bets were off. The Fu changed lanes and performed some covers. A stellar cover of ‘Freedom of Choice’ by fellow SoCal renegades DEVO shook the inner 80s child of everyone in the room, so what was in store next? A rewind back to the 70s of course to revisit a stuck in molasses, ton of bricks version of Blue Oyster Cult’s ‘Godzilla’. Tempo be damned, the pit turned into a spinning stomp of rock sucking in anyone in close proximity. When they finally stepped off stage closing their main set with the fuzz drone of ‘Saturn III’ (The Action Is Go), that same dude from the beginning of the show once again started continuously yelling “Play Boogie Van!” He soon got his wish as Hill drawled the opening line “Break one –nine…got your boots on” That guy lost it, throwing his hat and pulling off his shirt before jumping into the pit….a fan for life if he wasn’t already. 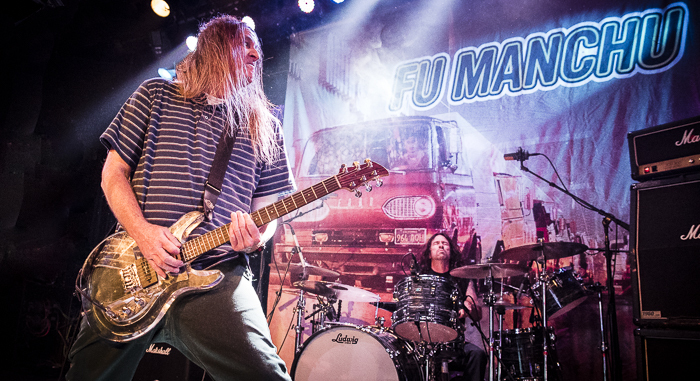 While Fu Manchu has not achieved the commercial success of some of their peers (some of which they influenced), they still rock with a hunger that has been with them from the start. The notion of packing into a van to blow the doors off of clubs across the country is still their mantra. 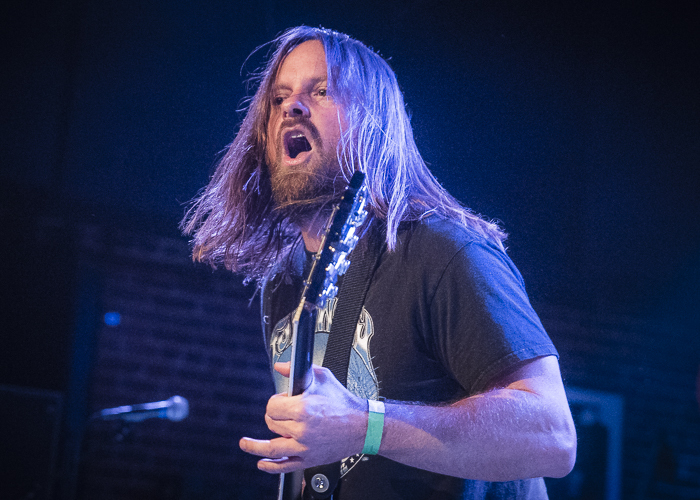 Judging by the success of their performance at Slim’s, the success of their current tour, and their impending release of new material in 2018 means that the Fu Manchu fuzz wah convoy will keep them as kings of the road. Find out more about Fu Manchu here.